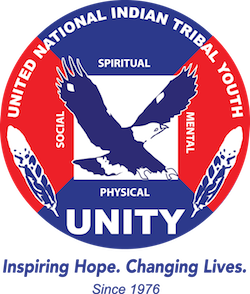 Introducing the 2013-2014 National UNITY Council Executive Committee – UNITY, Inc.
Ashley, a 19 year old Santee Sioux Nation tribal member, is the current Great Plains Representative. She was born in Yankton, South Dakota and grew up on the Santee Sioux Nation reservation. Ashley attended and graduated high school at Niobrara Public Schools in Nebraska where she was the only female to graduate with honors and had the pleasure of being homecoming queen. Ashley enjoys playing basketball, shopping, and spending time with loved ones. Currently, Ashley is a full-time college student attending Southeast Community College as a sophomore in the academic transfer program. Email: akayc6[at]gmail[dot]com. Cielo, 14, is Lakota of Rosebud, South Dakota and was born and raised in Riverside, CA. She is a sophomore at Norte Vista High School. Cielo is currently the Chairwoman for the Riverside Intertribal Council and the Pacific Area Representative for the Executive Committee. Cielo loves traditional and modern dance, singing, and playing sports. She is looking forward to enhancing her leadership skills and becoming more involved in youth leadership. Cielo is excited to meet new people as a representative of various tribes and youth councils in the Pacific region. Her goal is to ensure the youth voice is heard. Sonny, 19, belongs to the Kansas Kickapoo tribe and currently resides on the Kansas Kickapoo reservation. He has been with UNITY for nearly 6 years, since the 2009 national conference in New Mexico, where developed a passion to work with UNITY. Sonny is a returning Executive Committee member. He is a student attending Bacone College in Muskogee, Oklahoma with a wrestling scholarship. Sonny is available to contact through Facebook (Little Bear Johnson) or email. Email: littlebearjohnson1[at]gmail[dot]com. Aaron is 19 years old and a member of the Saginaw Chippewa Indian Tribe of Michigan. He currently attends Santa Monica College in California where he plans to major in broadcasting. Aaron is one of the founding members of the Saginaw Chippewa Youth Council where he served as Treasurer, and he was also elected Chief of the 3 Fires Youth Group. In his spare time Aaron enjoys traveling, hanging out with friends and staying active. Email: aleaureaux[at]yahoo[dot]com. Simon belongs to the Eastern Band Cherokee tribe and is from Cherokee, North Carolina. He is a returning member of the Executive Committee as the Southeast Area Representative and is looking forward to yet another successful year for UNITY. Simon is currently a student at Cherokee High School. Email: simon.montelongo[at]yahoo[dot]com. Tyler Owens is 18 years old and comes from the Gila River Indian Community. She is Akimel O’odham, Tohono O’odham, San Carlos Apache, Puerto Rican, and Cuban. Recently, Tyler has graduated from Hamilton High School in Chandler, Arizona. In the fall she will be attending Chandler-Gilbert Community College where she will be working toward a degree in Technical Engineering and minoring in Political Science. She is an At-Large Member for the Akimel O’odham/Pee-Posh Youth Council, which she has been involved with for the past three years. She is 1st Attendant to Miss Gila River, Lisa Hohokimal Hendricks. Tyler is also Chairperson for the Inter-Tribal Youth Council of Arizona’s planning committee. In her free time Tyler enjoys shopping, reading, and playing volleyball with friends. Sarah was born in the state of Washington and is a member of the Lummi Nation. Sarah, 19, is a college student at Northwest Indian College working towards her transfer degree; from there she plans to get a Bachelor’s degree in Human Services and Master’s degree in Educational Leadership. Currently, Sarah is the Female Co-President for the Xwlemi’ Youth Council and is a mother to a beautiful 2 year old son. Sarah is very honored to be serving her second term on the Executive Committee and is looking forward to the serving her fellow youth. Claullen is an 18 year old member of the Eastern Shoshone Tribe and grew up on the Wind River Indian Reservation in Central Wyoming. He attended school off of the reservation and graduated from Lander Valley High School, receiving the Hathaway scholarship and a student of the year nomination. Claullen plans to attend the local junior college for his associate’s degree before transferring to Colorado University for both his bachelor’s and master’s degree in business administration. He plans to use this knowledge to help his people. Claullen’s interests include volunteering, planning and conducting community events, helping the Wind River Unity Council, and watching and playing football. Claullen’s main goal as a member of the UNITY Executive Committee is to help the Rocky Mountain Area he represents become closer and more connected. Alex Toledo is from the Pueblo of Jemez in New Mexico. He graduated from Santa Fe Indian School and will be attending Central New Mexico College in Albuquerque, NM where he plans to study architecture and engineering. Alex currently serves as the Southwest Area Representative and has been attending the National UNITY Conferences for 5 years. He has served as a National UNITY Council representative and as Co-President for the Native American Youth Empowerment (NAYE) youth council in Jemez Pueblo, New Mexico. He’s ready to take on the challenges ahead and work with the Executive Committee to make the upcoming UNITY events and national conference a success. Sassamin, 19, belongs to the Mashpee Wampanoag Tribe of Mashpee, Massachusetts. She was born and raised in Mashpee, and graduated high school with the class of 2012. Sassamin is an active member of her tribe and holds the chairwoman position on her tribal youth council. Her goal as an area representative is to reach out to the tribes up north and help them start their own UNITY youth councils.